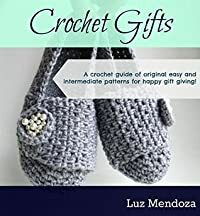 Crochet Gifts: A crochet guide of original easy and intermediate patterns for happy gift giving! If you want to make crochet gifts for your love ones that will be loved and treasured this is the book for you!, the book contains 8 patterns to create gifts for women and men, there are two home slippers, two finger gloves (arm warmers), two very lovely textured cowls, a summer shawl and a unisex slouch hat that converts into a neck warmer, this book will have the fall covered!. Please note all my patterns are written in standard american terms. For giveaways, coupons and free patterns please visit my facebook on: http://www.facebook.com/LuzPatterns and my blog: http://luzpatterns.com Thanks for visiting!